Resumption of mining at the Waste Isolation Pilot Project (WIPP) on Jan. 15 this year is the latest move toward full-pace operation since reopening in January 2017. Last April the deep underground repository near Carlsbad, New Mexico began accepting shipments of plutonium-contaminated or “transuranic” waste (including tools, clothing, gloves, soil, and debris) from federal nuclear weapons production. WIPP is now receiving six waste shipments a week from decades of accumulated bomb-making material. 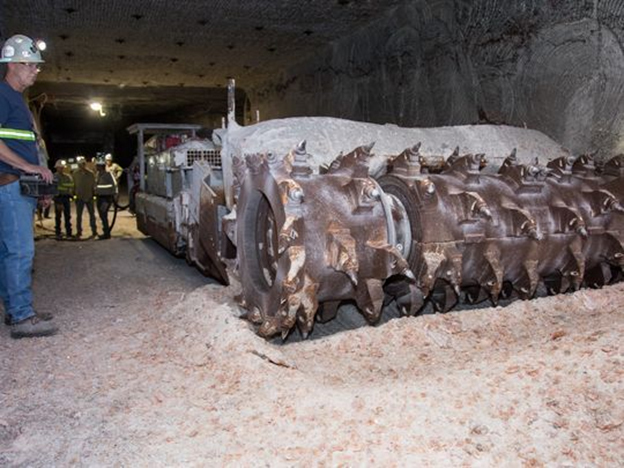 The waste is placed in one of eight chambers mined 2,000 feet underground in an ancient bed of salt which can be removed at a rate of 10 tons per minute by a heavy gouging machine. The facility is still recovering from a Valentine’s Day 2014 accident that contaminated 140 workers, the mine, elevator and ventilation shafts, and surface equipment with plutonium dust when a barrel of waste burst or exploded after being packed at Los Alamos National Laboratory with the wrong type of cat litter. The repository has yet to return to its previous level of operation. Several safety concerns have not been addressed. “Contaminated air is circulating through the facility, and being vented out. That’s not how it was supposed to be operated,” says Nuclear Waste Program Director Don Hancock of Southwest Research and Information Center (SRIC). The Mining Safety and Health Administration, a branch of the Department of Labor, reports 32 unresolved violations since March 2015 with no resulting penalties. Despite the violations, the facility was recertified by the EPA as “compliant” with waste disposal regulations in July 2017. A return to full operations is expected by 2021 when the new ventilation system, estimated to cost $400 million, is complete. While that basic milestone has not been met, there are already six separate Department of Energy proposals for expansion and a Strategic Plan that exceeds capacity limits. The most recent proposal includes constructing an above-ground temporary storage pad and increasing the surface waste storage capacity seven fold. The Strategic Plan foresees storing 34,000 cubic meters (20%) more than the legal limit of radioactive waste.